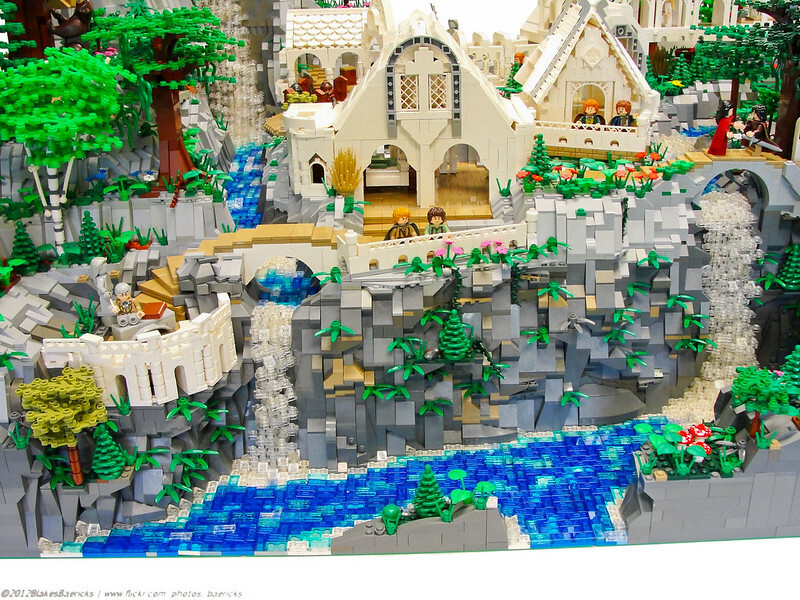 Due to both of our unique interests in Lord of the Rings and our supreme passion for the LEGO brick, we decided to combine them into a creation for Brickfair 2012. This was our second time collaborating on a creation (our first collaborative being Amon Hen), and this was definitely the largest, hardest, and most fun project that either of us have worked on. Because of our unique building styles, we complemented each other well and used the best of both our talents to great effect. We chose Rivendell because of its beautiful landscape, its iconic nature, and the fact that it will be in the upcoming Hobbit movie trilogy. It is our hope that you will enjoy the natural beauty and our creative gifts as expressed in this artistic representation of Rivendell, from the Lord of the Rings trilogy by J.R.R. Tolkien. 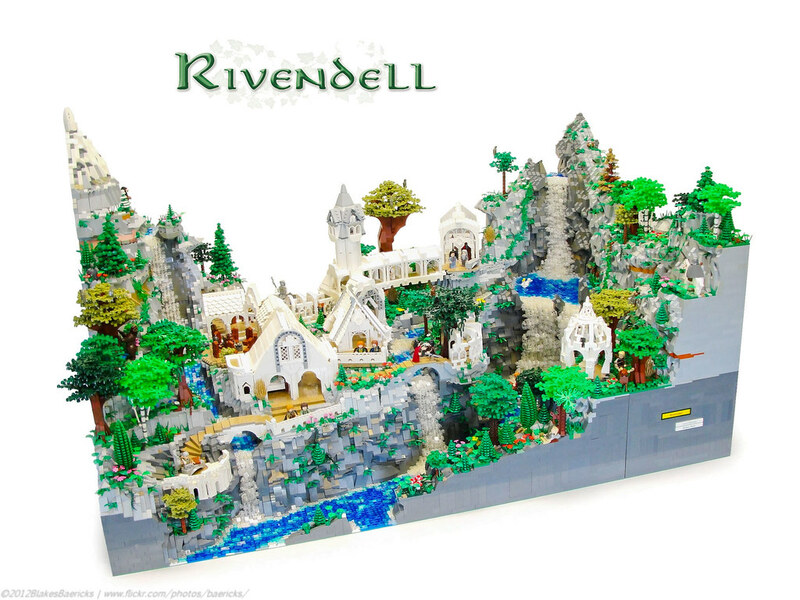 -Dimensions of 40" x 30"
-More than 50,000 pieces involving 1 Bricklink order, 1 LEGO payment, 2 PaB boxes of 1x1 and 1x2 trans clear plates, 2 combined collections, and various other sources were needed in the creation of Rivendell. For me [Blake] its impossible to really sum up this experience with words. I absolutely loved working with my good friend Jack, so this experience gave us a lot of time together. It is a kind of bitter sweet experience of sorts. This is without a doub the hardest, best, and comparatively most rewarding creation I have ever worked on. Seeing it come to completion brings many differing emotions to mind. For example, the rockwork was THE hard part about this creation, and the part that took my undivided attention. Jack focused more on the elven buildings raising the ground, but the rocks and water are my handiwork (or fault). Putting the last few rocks in place was a very satisfying time. I will hopefully write more a bit later. Be sure to check back often for updates in the description. I took a video just to show the layout and connect some dots regarding the positions of details. I found it to be quite helpful. Here are some detail shots that didn't merit their own large picture. I realized that I took up to 280 pictures (which was then narrowed down to 140) so having that many large pictures really clogs things up. Because this was built for Brickfair, this needed to be able to be transported down to Virginia. Our solution to that problem (and the same solution as in Amon Hen) is that the creation breaks apart in 8 separate modules which are then able to be boxed up and stacked for easy transportation. The modules presented a large difficulty for us this year, because the mountains needed huge boxes. Fortunately, we managed to scrape up enough boxes to get it down and back safely. The modularithy also presented a challenge because we needed to blend the seams while also making them able to come apart. This is our result. Some brief shots documenting the progress of the creation as we went along. You'll notice how we started by laying out the water. This was necessary because it was the lowest elevation of the landscape and we needed to build from the bottom up (like you guys probably do). After the water, we worked on the rocks, leveled things off, began the mountains along with the houses and finished off with the tiles on the water and the trees/foliage. These pictures will give you some perspective on our task of setting things up. We had a huge barricade in the middle of the walking area because of all our boxes. We had the opportunity of being interviewed by a reporter from GBTV. It was a fun little interview for the kids program (I believe). That is me on the left and Jack on the right. A picture of me with Rivendell. I really wish we could've gotten a picture with Jack and I together with the MOC, but he left early Sunday, so we never got the opportunity. Not too long ago, the LEGO community lost one of its finest FFOLs, Heather Braaten. As a subtle tribute to the fallen heroine, I included her signature minifig in this creation. A cookie to whoever can find her! Jack Bittner, for building this with me. Thanks for being the fun-loving, encouraging, fist-pumping champ that you are! Awesome work mate. This one was well deserving of all the high fives. Dave Kaleta, for his amazing rendition of Rivendell which inspired us to no end. Sean and Steph Mayo, for your encouragement, your sacrifice, and your shipments of LEGO. Stuartt Clark, for helping us set up at Brickfair. Ladies and Gentlemen, thank you for your time. I hope that you enjoyed viewing my latest creation. Please leave a comment letting us know what you thought of Rivendell. Commments/suggestions/constructive criticism is always welcome. And as always, SOLI DEO GLORIA! Blake, your builds are absolutely amazing! I especially like your landscapes. I'm 20 yrs old, and I'm getting back into LEGO. How do you start your process for these huge landscape builds? Where do you typically get all of your bricks? And have you ever done any commissioned work? Beyond. That is the best adjective I can come up with. Beyond anything I have seen or could do. WOW!!!! That is mind blowing!!! That is just AMAZING!!! How long did it take to build that?!?!?! That is so Awesome!! Great job!!!!! that's a cool basketball net piece usage in one of the roofs. I honestly have no idea why I haven't commented on this before. I'm pretty much speechless here. Absolutely fantastic! The buildings themselves just look so... so... elf-like. :P Then there are the waterfalls... masterpieces! My favorite is the one with the rock in the middle. After looking at the waterfalls my eyes turn to the stairs cut out in the cliff. And as I do that I see the trees! Everything is so well done! I believe this is my favorite MOC of all time. Thank you for creating it! I have no words... This is my all-time favorite MOC! Outstanding job, Blake! Your work never ceases to amaze me! 300; that's absolutely astounding. Another creation soon? Great news. I'll be looking out for it. Well fellas, we made it to the 300 mile-mark! Thank you for all of your support. Look out for our next creation in the upcoming month! Stay tuned. This is an unbelievable creation Blake, I just love your creations. This MOC is the MOCiest MOC a MOCer ever MOCed. Wow. Just. Wow. I got it. What you achieved that not a lot of other builders can (I'm not close) is making it look alive, as if the water is really falling. Wow. Absolutely stunning!!! Perfect in every sense! I love it! Honestly, one cannot praise this enough. It is a masterpiece. This is one of the best Lego Creations I have ever seen! This is great and all but there's just one problem. This should be the Most Popular creation on MOCpages. You did an Outstanding, Fantastic, Unbelievable, Amazing, Very Creative job on this. Incredible! I could examine this for HOURS! Fantastic job! this is...beyond! a documentary about teamwork, and talented designers artists, no less, I ll have to come back, as, I m going for work, just fantastic! This is sooooo awesome! I LOVE IT! Everything, and I mean everything, is perfect. Absolutely perfect. I cannot describe what I feel looking at this right now! 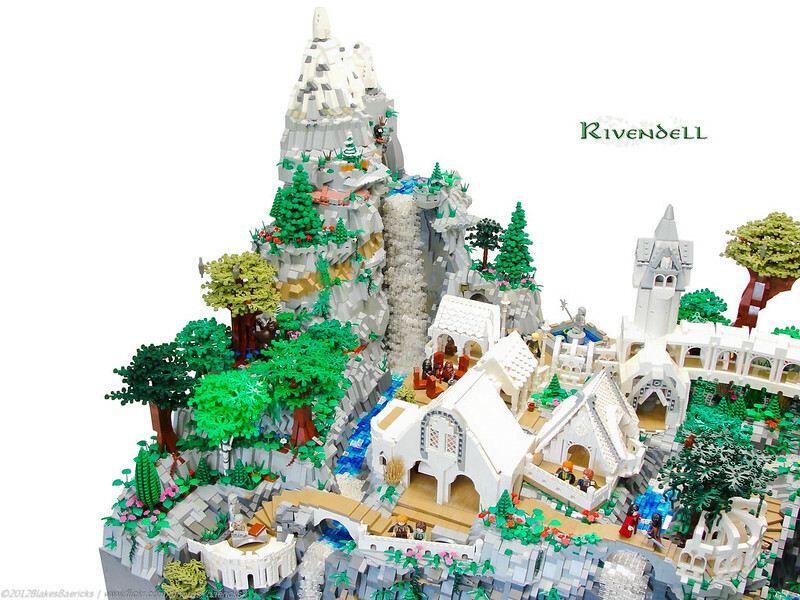 Easily the best LEGO Rivendell I have ever seen, it may very well be the best creation I have ever seen. EVER! Amazing detailing, and the Council of Elrond in the section in Rivendell is superb, adding a nice touch . The waterfalls are amazing, and adding the balconies with Sam, Frodo and Gandalf, Elrond was great. I really enjoyed seeing the trees and rocks, which were amazing, along with everything else! Great, great job. The bridges and curved, elven designed buidings and halls were so cool! Sorry that this comment was so long. Theres was so much to say about this AMAZING creation! I have an LOTR group that you can join, if you have time or want to. Once again, amazing job! No words can express how i feel right now...Great job guys!!! I just say this build in a hobbit magazine! I haven't seen such a fantastic Moc in a long, long, time. Seeing it at brickfair was amazing! Your New Best!!!!! Great job Blake! I just LOVE everything in this creation...I love the rivers and trees....Every detail is just perfectly in place. GREAT work blake! If there were a word for this, I don't think it would be good enough! This has to be one of the most amazing creations I have ever viewed! I can barely put YOU into words! Stunning creation, and you are stunning, too! Blake, you're a LEGO genius. Whatever you build is great but this is absolutely 100% sensational. How in the world do you do it? I can hardly wait for your next piece of art cause this is what your creations are. BEAUTIFUL!!! And slowly, the great Rivendell climbs towards the top of Mr. Baer's Most Popular... there's nothing to say here that hasn't already been said (not meaning I won't say it again)... AMAZING job. Congrats to you and Mr. Bittner both on another mouth-agape-in-awe creation. I cannot think of anything worth saying about this, except that it is an amazing and near-perfect creation. Wow. Blake I'm saying this from my heart and soul this is the most beautiful thing I've ever seen completely amazing you have a god given talent my freind. Wow Amazing Please Post Instructions! (Yeah, just kidding.) I think my favorite part of all of this are all of the many beautiful trees and how each one is different from the last. Amazing job Blake and Jack! 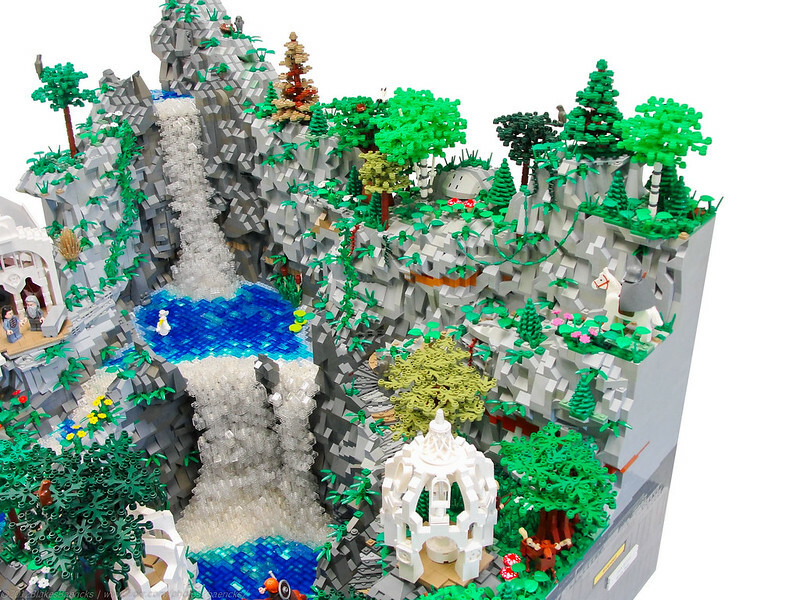 This Is AMAZING, I Was Shocked At ALL The Nice Detail In The Waterfall And The Rest Of The MOC!!! Overall It Really Gives The Look For Rivendell. WOW great job. There is no excuse to be added as a fave builder! Nice one!!! Very rich landscape, and very big attention to detail. Great MOC, and to God be the glory for sure! You know i could use a crash course on how to build cliffs and mountains like that with all the slope pieces. I've tried but it never turns out right. Again AMAZING! UPDATE: I redesigned the layout to be more viewer-friendly. This is AMAZING! I'm speechless. Wow het is echt prachtig !!! Hoelang heb je er aan gewerkt ????? At first I thought this was made out of LEGO, but now I see it is made out of awesomeness. This is the most incredible set I have ever seen. Fantastic work guys. I cannot describe the amount of awe I have! I especially love your attention to detail, and the way the whole scene is layered and full of detail. This is so beautiful I'm going to have a heart attack, oh well after seeing such a sight I'm almost ready to die. UPDATE: I added some credits on to it. This truly was a collaborative. I found a couple of frogs...excellent work guys! Quoting John Daniels P.S. Do you watch GBtv? No, I don't, but I am a large fan of Glenn Beck. The level of detail is absolutely stunning! You can't stop looking, and the vegetation is superb. Woah! I knew I was in for a treat when you said you spent twenty hours on the pictures. The layout looks very enjoyable to explore. An accurate and excellently done creation! Congratulation on that beautiful moc. It's brilliant! The trees, the water, the rocks, the buildings ... I have to change my under wear ... Interesting insights in the Rivendell underground. I never studied so many pictures as long and closely as I did on this Moc. You guys rock! The Most amazing thing ive ever seen made out of legos thankyou for creating it! Wow, amazing! This is a great build! I love the waterfall, and the stairs, and the landscaping! Thanks one and all for your comments and support. This is doing wildly better than we could've hoped for. Thanks a ton! Quoting Lego Builders How long have you had this idea? Not too long actually. It has been long in the process. We first finalized the idea and began work I think close to 2 months ago. Quoting Night Hawk _ Tell me how do you get so many pieces? The pieces are accumulated through long years of LEGO purchases and gifts from friends and family. Quoting Adam L. On another note, do you and Jack share a collection? Or did you build individual pieces by yourselves, then put them all together after? If neither of these, how do you know whose pieces are whose? Quoting Ru Corder Any idea on what scene from LOTR you want to build next? Good question, Ru. At this point, I am still "hungover" from this project, so I doubt I will be attempting anything too soon. Great build really well presented. So much to admire, well done to both of you. Mind. Blown. Simple amazing Blake! I can only imagine how hard it must be to build a MOC together with somebody else and make it look homogeneous, especially when it is one large MOC and not a collection of MOCs put side by side. You both managed this task perfectly. I will not elaborate on the countless details, but be sure you blew me away (several times). Congratulations to both of you. So... much... MOCage... so... few... pixels... dtunvdsdnmkjhg.8 . That is what happens when my mind is blown. I'm sorry that I could only view a few of the details (on a 3ds browser) but from what I saw thats 5/5 and a favourite builder too. Lets keep pushing the likes and get this to No.1 on MOCpages! An amazing build! I can't imagine how long it took you to build this. This build is a good example of why your one of my favorite builders! 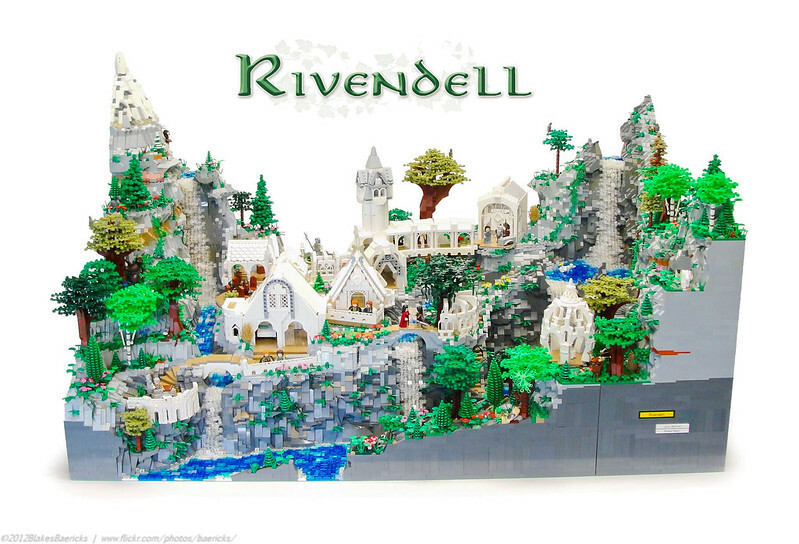 so under rivendell, there is a rainbow warrior layer of solitude... very nicely detailed moc. NO FAIR!!! "I" thought that "I" had a bunch of pieces... Sigh.. There are no words that can describe this moc. This is definitely your best creation. Great to know what you look like! UPDATE: AS Ian stated below, I posted a video with a cinematic overview of the creation. Ooo, lovely video too! The Lord of the Rings soundtrack happens to be one of my all time faves in the film-score department. Bonus points for that! That is what I call an amazing build! Job more than well done! Thanks for all the inspiration. I would comment on this magnificent model more, but i need to get building! I am simply at a loss for words! Sorry it took two days to comment on this but I've been looking for the bottom half of my jaw that had fallen off (turned out it rolled behind the fridge). After a quick reattachment with some duct tape and silly string I got back as quick as I could to comment. And can I just say that this... is breath taking. Thank you. ~ Chris. I love the flintlock pistols as the deer's feet technique; the whole MOC is full of creativity and it's just amazing! Amazing! This is one of the best Lego creations I have ever seen! It is outstanding! Blake - simply awesome - I congratulate you and Jack. A beautiful creation. Inspirational. bless you - your creativity is truly a gift. Can't wait to see what else it releases ! Give a true artist enough Lego and this pops out - incredible! One of the best dios I've ever seen. Fantastic work! The landscape, buildings, and the other parts of the diorama are breathtaking, and this is one of my very favorite LotR models; the attention to detail is superb. Thanks for giving the glory to Him! I'm blown away! beautiful build! there'[s too much to say about it, so I'll sum it up- fantastic build, great techniques- its stunning! Well done Blake, very well done. The achievement in terms of depth and scale are both impressive. I do have a couple minor critiques - 1st, I think it would have been better to use white under the trans blue of the pools, and create more fading between the falls and still water. I'm suggesting this would have helped the effect of movement and keep the water color more consistent. 2nd, from my point of view their is just too much in the build. It's loaded with plants, colors, animals, etc. In the end, I feel like it really loses some of the elven simplicity so appealing about Rivendell. However, please keep in mind that I find your build enjoyable to view and quite impressive. Bravo to the both of you! Excellent job Blake! Congrats to you and your friend for such an incredible piece of work. You are genius... I love it! I love all of the details here so much. Amazing job Blake! Any idea on what scene from LOTR you want to build next? this more than epic! WOW! I'M spechless... it looks like it is drawn! I'm gonna comment again. But there is a reason behind it. Blake, this is just too good to be true. LITERALLY! 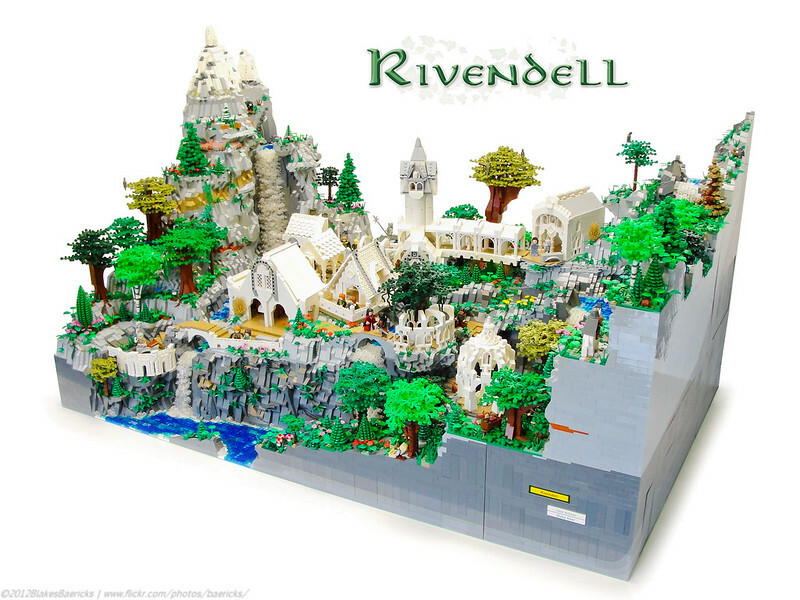 Blogged on BrickEnd: http://brickend.blogspot.com/2012/08/rivendell-by-blake-baer-and-jack-bittner.html That should help! Blake, this is so what of awesome! I can't find words for the beauty of this insane detailed and lovely created Moc! You (both) have outdone yourself again! - K.
so far you have blown me away with every moc you come up with!!!! great job!!! Excellent Job. too Much to take in all at once. Thanks for all of your support! This comment is just noting the achievement of 100 likes. I will respond to all your questions at a later date. Being such A big fan of lotr this is a dream moc epic job. Still struggling to believe I'm really looking at this. -slaps self in the face- Yep, I'm really awake! Jaw droppingly gorgeous Blake (and Jack)! Oh, and it's always nice to see the actual guys behind the bricks. Thanks for sharing this with us! I absolutely love the picture of Boromir riding in front of the waterfall. 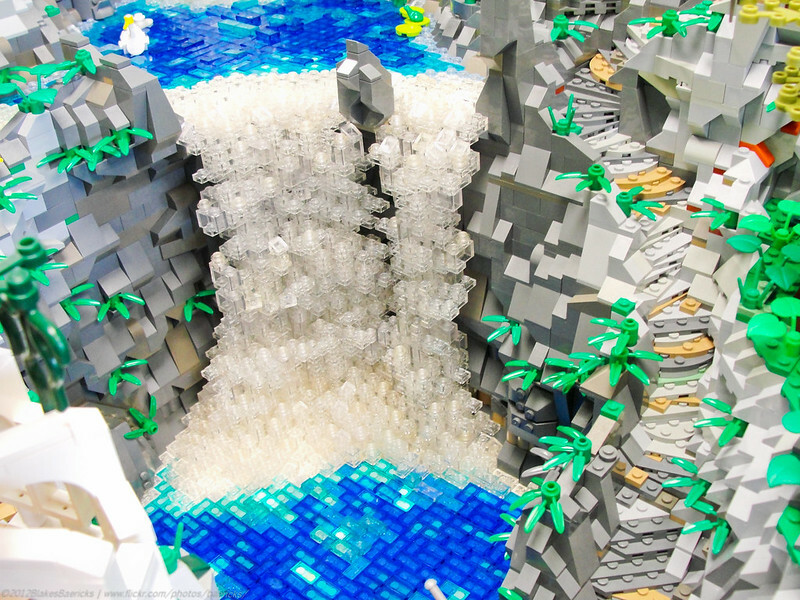 I'd also venture to say that your Lego waterfalls are the best I've ever seen. The sense of motion is mind blowing. Since you said you're open to it, the only little "constructive criticism" I'd put forth is: use all the official LOTR figs, as opposed to just some and not others (namely Aragorn). Other than that small matter of preference, stellar work fellows! Extremely well done! I'm nearly speechless...nearly. This may just be the most beautiful build I have ever seen. I have been gawking at it for the last fifteen minutes trying to take it all in. Ok. Where do I start? (Big inhale). The landscaping is the best I have ever seen. The waterfalls are layered so perfectly to achieve the effect you were looking for. I love how you included many of the well-known scenes in there. I'm assuming that's Boromir arriving. Sam and Frodo discussing whether it's time to go back to the Shire. Mary and Pip undoubtedly up to some shenanigans. The architecture is not only well done, but actually looks elven. You were able to take LEGO and make the same impact as Peter Jackson himself, and that is saying something. The trees are well formed. It is impressive that you were able to take such a massive work and make it modular like that. And even there are two different styles at work here, they meshed together seamlessly. Blake and Jack, this is a masterpiece and I would like to put it on My Current Favorites on my page, with you permission, of course. Great job and can't wait to see what's next. Soccer players these days.... Brilliant job guys! Heavens! This is stunning! Great job! Blake this is nothing short of stunning! The degree of complexity in the landscaping - with it's curves and angles, multiple levels, and intricate color arrangements - is mind-boggling. It's a shame Lego doesn't currently make golden and orange tree foliage colors, that would've been nice. (Although Sterlings recently mentioned a custom supplier that has fall colors.) Amazing details throughout the build as well. This is one we'll all remember for a long time, guys. Congrats on a BEAUTIFUL creation!!! Amazing set! Love all the details, right down to that swan. Impressive modular design, too. Congrats! That is quite possibly the most awe inspiring thing I have ever seen. This is really nice! Love your work! Wow that is absaloutly amazing i'm lost for words. Blake you did a great work on the water and rockwork, as did jack with the elven buildings. Spectacular in every aspect. Just to note your foliage work is brilliant; those little fir trees are my favourites. The disk tiled roof is a nice technique. Thanks also for the WIP pictures - always nice to see the foundations holding these epic builds up. Wow! The trees, the water, the rock work, the buildings and the scale. The whole thing is amazing! I hope that I will someday have enough LEGO pieces to build something like this. --John P.S. Do you watch GBtv? Beautiful artwork. This is too amazing for words to describe. ...Is there any words great enough to describe this? Basically EPIC! ..... I have nothing to say about this masterpiece that hasn't already been said, I'm sure. Except that you look nothing like your sig-fig. Great job guys. It's almost hard to take it all in with just photos, but thanks for sharing so much. I especially liked the process pics at the end. Hope you can save that one for a long time. Glorious work Blake, that is a beautiful rendition. Blake, you have done it again! I usually can go on and on and never stop. But in this case I think a few words will be more powerful. Especially since Rivendell is one POWERFUL MOC! The time, effort, energy and money it took is more than awesome! The design ability and the thinking outside a box of LEGOs is spectacular! Your genius is incredible (the basket from a basketball set as a copula is a good example of that! I had two problems with this model: 1.) I wanted more pictures, and was saddened at the end, 2.) I wish I could have seen it in person! Keep on building! WOW!!! This is truly amazing! There is so much detail that it really does bring out the beauty of nature. I love the animals packed in this diorama. One of the best mocs I have ever seen! You guys are really talented. Blake, Jack, you've outdone yourselves. This is truly spectacular, a diorama deserving of the title "epic". The landscaping is top-notch, including nearly every type of terrain and all done to perfection. The architecture really stands out for me though, as it has that distinct Rivendell vibe. I like how you guys included all sorts of details like Bilbo and the circle of chairs. Another thing I noticed was the abundance of spiral stairs, I salute you for tackling such a tricky endeavour while working at a much larger project. Well done indeed, this MOC won't soon be forgotten. Wow. The waterfalls are the best I've ever seen, and the rocks are marvelous too (the different colored veins are a great detail). The architecture looks great and is very accurate to the style of the movie. Everything fits together seamlessly. Overall, this is an astonishing build. It would be a waste of time to try and find words to describe this MOC. Sensational! This is awesome. On another note, do you and Jack share a collection? Or did you build individual pieces by yourselves, then put them all together after? If neither of these, how do you know whose pieces are whose? Wow... amazing! Beautiful work! The trees and the plants are amazing! The waterfall and the rivers are incredible! The animals like the Deer,swan,and other animals fit the MOC perfectly! Your rock work and the water is amazing also the structures are great! Keep up the awesome work! Amazing work on this, you really did this iconic location justice. It was great seeing it in person as well as meeting you. I'm really looking forward to whatever you decide to build for Brickfair 2013, which I am determined to go to. 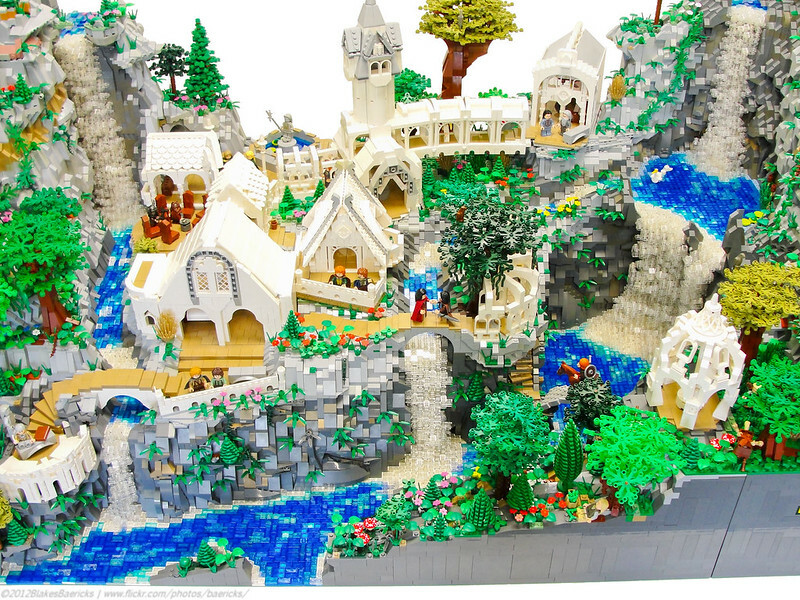 Excellent parts usage for all of the elven buildings, great rockwork, awesome water technique and texturing, and nice placement of minifigures. Keep up the awesome work! Wow! :D i loved the part in LOTR! Great Job! That is an absolutely stunning creation. Tell me how do you get so many pieces? Absolutely amazing! Your work truly inspires me. I saw it at brick fair, It is AMAZING! Great job! You are a true lego genius. Wow this is the most amazing build i have ever seen!! All of it is snoted and it is very detailed!! Magnificent! This is an amazing build. I really cannot imagine how much work went into this beautiful moc! You have created everything in the most amazing detail. The landscaping and buildings are so realistic. You have used such a huge amount of detail in such a massive moc! Its not just big. Its as beautifully creative as any small scale moc. Your piece usage is simply inspiring! I am thoroughly impressed. I would say this is one of the greatest LotR mocs on this site! Fantastic! I really wish I could have gone to see it in person. It would take countless hours to go over and find all the neat little details you two incorporated into this masterpiece! Both of your building styles truly compliment each other. I can't wait to see what piece you two will take on next! Such masterful design and presentation! Not a single corner left untouched by epic details! Congratualtions on your success! Wow, incredible! This is one of the coolest dioramas I've seen. Holy cow, Blake! I didn't know you had made this one. I am in awe at how you can build! Wow, that's quite the dio! Wish I could see it in person! Although, with this many pictures, I almost have, good stuff.